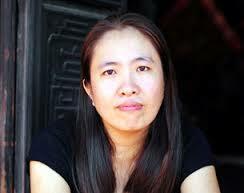 Nguyen Ngoc Nhu Quynh, who blogs under the name Me Nam or “Mother Mushroom,” is a Vietnamese political and environmental activist. After years of government surveillance, harassment, and intimidation, on October 10, 2016, Me Nam was arrested in Khanh Hoa and charged under Article 88 of the Penal Code for “conducting propaganda against the State.” On June 29, 2017, Me Nam was convicted and given a 10-year prison sentence for writing blog posts defamatory of the Communist regime and distorting government policies. The appeal of her sentence was heard and denied on November 30, 2017. On October 17, 2018 she was unexpectedly released from prison and flew into exile in the United States, landing in Houston with her elderly mother and two children. Me Nam first began blogging on parenting websites in 2006, and took her moniker “Mother Mushroom” from her youngest daughter’s nickname “Nam,” or “Mushroom.” Me Nam turned her focus to social activism after a hospital visit where she observed that patients too poor to bribe hospital officials were denied medical treatment. Online social media websites like Facebook have been Me Nam’s main outlet for her work, and in response to increasingly aggressive attacks by the Vietnamese government to prosecute Internet activism, Me Nam helped found the Vietnamese Bloggers Network (VBA) in 2013. The VBA has subsequently been banned in Vietnam. In addition to criticisms of government corruption and human rights abuses within Vietnam, Me Nam was particularly active in massive protests surrounding the environmental disaster caused by the Formosa Ha Tinh Steel plant. In April 2016, a 120-mile stretch of the Vietnamese coast experienced a massive fish kill that devastated the marine ecosystem, sickened countless people who consumed the fish, and crippled the local fishing industry. Me Nam and others, including Nguyen Van Hoa, who himself has been imprisoned for his advocacy work on the case, criticized the Vietnamese government for their slow response to the crisis and their refusal to disclose the nature of the chemicals released, even to doctors treating those affected. After her arrest on October 10, 2016, police singled out among documents found in her home a file that included detailed information culled from state media regarding 31 citizens who died in police custody, claiming that her work “lowers the prestige of the people’s police force.” Between October 10 and just hours before the commencement of her trial on June 29, 2017, Me Nam’s family, including her two young children, were not alerted to her whereabouts and well-being. Furthermore, she was denied the ability to meet with her counsel until the week before her trial began. The court at Khanh Hoa continued the government’s aggressive stance towards political activists, finding Me Nam guilty of “conducting propaganda against the State” and sentencing her to ten years in prison. Me Nam subsequently appealed the decision of the court and a hearing was convened on November 30, 2017, where her conviction and sentence were upheld. After supporters who had gathered outside the courthouse began to protest the decision, they were quickly attacked and beaten by men in civilian clothes while uniformed police refused to intervene. November 30, 2017: Me Nam’s appeal is heard at the People’s High Court in Khanh Hoa. She admits to writing articles critical of the government but states that this does not constitute a crime. Her conviction is upheld. June 26, 2017: Me Nam appears in court at Khanh Hoa to stand trial. She is unapologetic for her criticism of the government, stating, “Each person only has a life, but if I had the chance to choose again I would still choose my way.” She is convicted and sentenced to ten years in prison. March 29, 2017: Me Nam receives the International Women of Courage Award by the U.S. State Department. Her daughter accepts the award on her behalf. April 2016: Massive fish kills occur as a result of negligent chemical handling at the Formosa Ha Tinh Steel plant. Me Nam is one of many prominent activists to call for greater government intervention in the case. The government eventually demands $500 million in restitution from the company. November 2015: Me Nam calls for a rally to protest a visit by Chinese President Xi Jinping to Vietnam, citing China’s poor treatment of ethnic minorities and its detention of fisherman. April 10, 2015: Civil Rights Defenders awards Me Nam with their award for the Civil Rights Defender of the Year. January 2013: Me Nam helps establish the Vietnamese Bloggers Network as an answer to increased government crackdowns on free expression. September 3, 2009: Police arrest Me Nam in the early morning relating to blog posts critical of Chinese bauxite mining on the Spratly and Paracel islands. She is held for ten days before being released. Early 2006: Me Nam begins blogging after witnessing institutionalized bribery and corruption during a hospital visit with her daughter.